Over the past few days I've been building the structures that will represent Gordon White Lumber at Pauls Valley, on the GC&SF. The main construction is complete, but I still have to paint the buildings, add signs, and perhaps some detail parts. Here are the buildings sitting alongside the siding that will service them. The buildings need to be raised a few millimeters so that their doors match the height of the freight car doors. 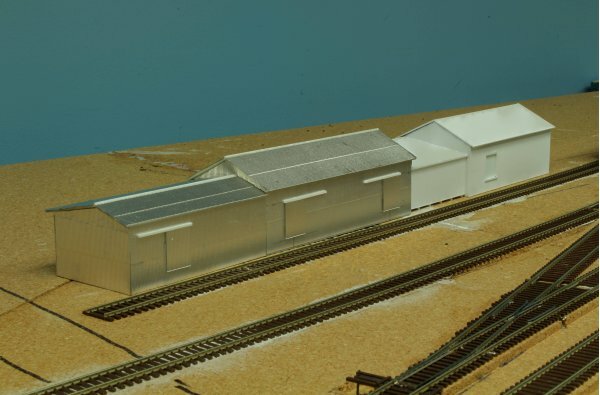 Two buildings were made from plain styrene sheet, to which I attached corrugated metal siding. The other two were made from Evergreen "metal siding". The real metal siding has the same width "ribs" as the Evergreen siding, so I'm hoping that once the buildings have been painted and weathered, there'll be no obvious difference between the two materials. Now for the bad news. During the week I received an email from the real Gordon White Lumber. They told me that Gordon White Lumber (which also has yards in several other cities around Pauls Valley) only acquired the Pauls Valley yard in 1981. The yard was Burke Lumber in the 1940s, and was owned by Roy Perkins in 1960 (the year that I model). I suppose that I should change the name of my industry to Perkins Lumber, but that won't happen soon as it will involve replacing a lot of waybills.